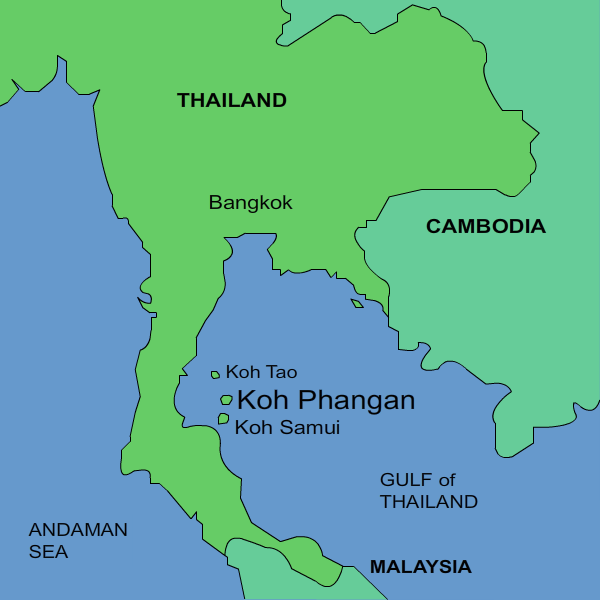 The latitude of Koh Phgangan is under degrees 10 from the equator. This places the island in the topics. Koh Phangan is hot all year round. If you live on the island than you notice the subtle changes in the weather over the year, but for a tourist the weather is consistently good. It does rain quite a bit, but for only short periods of time, and afterwards the sun comes out and everything soon dries out. 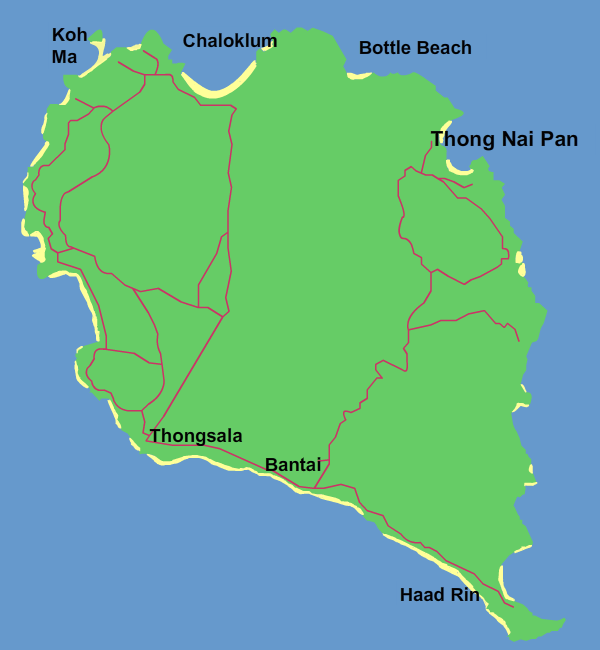 In short, Koh Phangan is a typical tropical island. For years the inaccessibility kept Thong Nai Pan a secret from the world. Even the Lonely Planet was coy about the beauty of the Thong Nai Pan area for several years. Thong Nai Pan is located in the north east of Koh Phangan. It is one of the most mountainous areas of the island and for years the road to Thong Nai Pan remained mostly unconcreted. When it rained the road became muddy and bogged down so all but 4 wheel drives were unable to tackle the road. During long dry periods the road became dusty and slippy. It was the bad road that kept all but the devotees of Thong Nai Pan away. Since 2008 major road works have greatly improved the road from Bantai to Thong Nai Pan. All the dangerous parts are paved, and now only a small stretch is unconcreted. Within a couple of years all of the Thong Nai Pan road will be concreted. Thong Nai Pan is a double bay surrounded by an ampitheatre of mountains. The mountains are tree covered. Other than the beach area and the hills near the beaches, the area remains undeveloped. It is a pristine natural environment. This is one of the main reasons why the area is so popular. Koh Phangan is 700 km from Bangkok. It remains difficult to get to Koh Phangan from overseas in one journey. The quickest route is to fly to Koh Samui and then to take a 30 minute ferry over to neaighboring Koh Phangan. 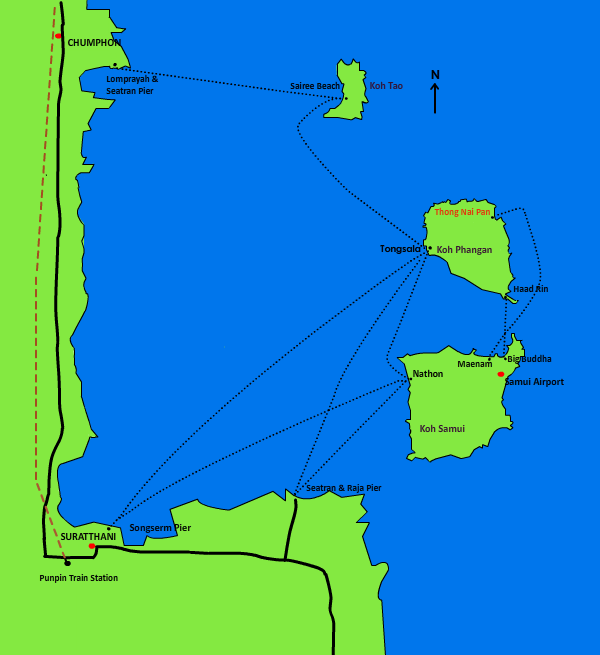 The problem is that the last ferry is at 6.30pm. Many international flights arrive too late in Bangkok to make the last ferry. The choices are to stay the night in Bangkok or in Koh Samui. Things could change soon. Koh Phangan airport is being built near Thong Nai Pan. This will provide a useful new travel option. For more information about getting to Koh Phangan and Thong Nai Pan please see our travel section. We endeavor to give you the most up-to-date travel information. You can see what the weather in Koh Phangan is like by referring to the weather widget in the righthand column. The weather in Koh Phangan is generally great except for during the rainy season. The monsoon in Thailand starts in the north and works its way down the country. It varies from year to year but generally it rains for about a month from the middle of October to the middle of November. After the main rains the sea often remains stormy until December. During this time the sea comes up high and the beachfront businesses use sandbags to protect against flooding. Few if any tourists are around during the rainy season. The infographic below gives information about average temperature, rainfall and hours of sunshine in Koh Phangan. As well as providing maps of the Thong Nai Pan area to help you find what you are looking for this website also uses geo-tags in its coding. These tags relate to Google Maps and help search engines find content related to a specific geographical area. Unfortunately, Google maps is woefully out-of-date and low resolution when it comes to Thong Nai Pan, which may not be a bad thing.